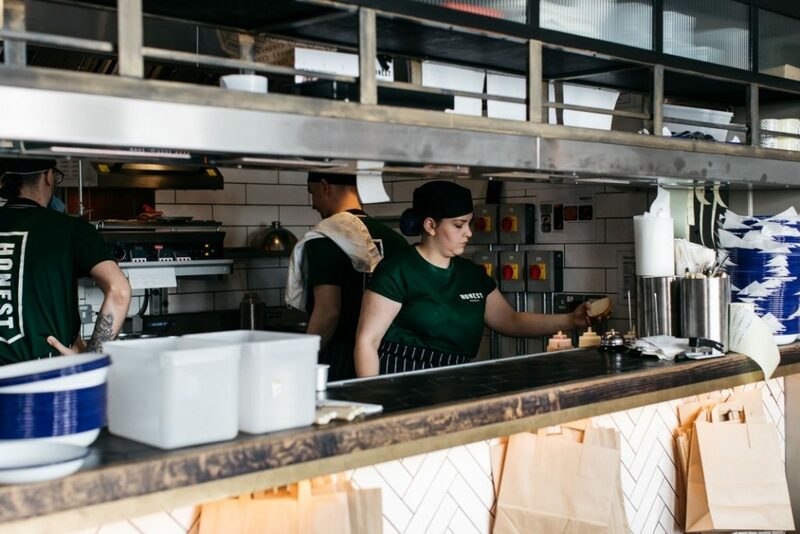 BN1 looks closer at what makes an Honest burger. 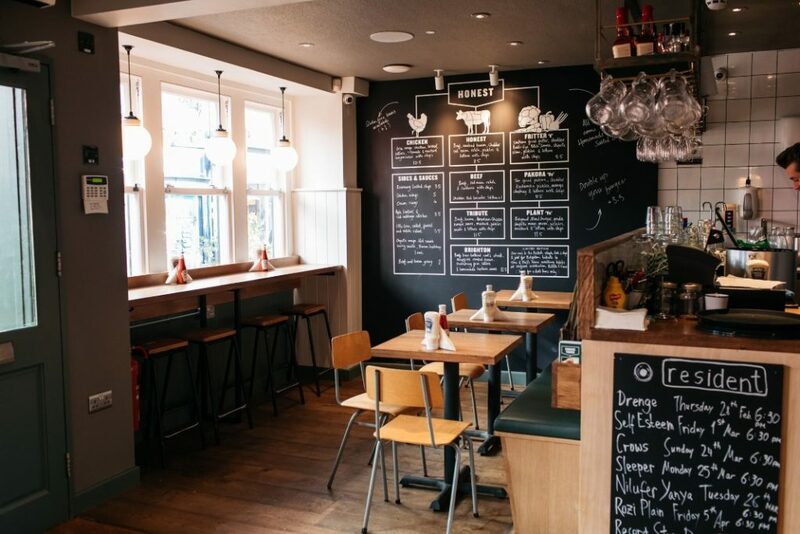 Following our recent review of Brighton’s new home-grown burger spot, BN1 were invited back to Honest Burgers for an intimate and eye-opening evening with the Honest guys themselves – Tom Barton and Phil Eeles. As founders and owners of the hit chain, Tom and Phil wanted to show us in detail, exactly how much effort goes into their food at the aptly named “Meat & Potatoes” event. This was essentially the same training that they give their staff, ensuring all of their employees understand what they’re serving and the interesting background behind it. We began our evening by sampling some delicious “Honest G&Ts” made with their own brand of gin produced by Psychopomp. We had a brief chat with Phil about the new Brighton branch and you could tell he was very proud to have brought the brand back to Brighton where it all began and rightly so. This is the 32nd branch of Honest Burgers and any restaurateur will tell you that’s no mean feat. The lesson formally began and we took our seats. We were situated by the busy open kitchen, a fitting location to learn all about the Honest menu, as food was cooked and plated in front of us throughout the presentation. 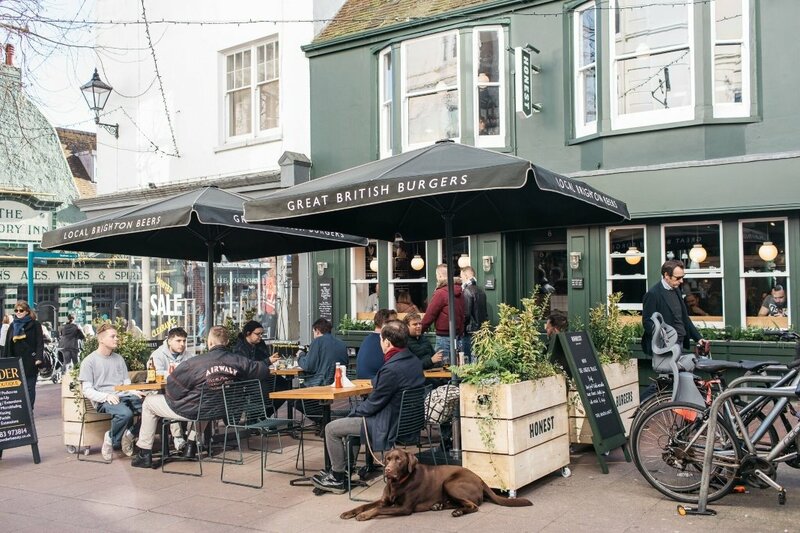 Tom began by giving us a short history lesson about the business, how he and Phil met in Brighton working at Riddle & Finns, how they dreamt up the idea of a burger place over a few beers and most impressively, how they actually went ahead and did it! Originally a small marquee tent catering events around Brighton, the guys focused on quality from day one, refusing to sacrifice their standards for any reason. If you ever get the chance, ask them about the midnight chip incident, great story. Tom then gave us what can only be described as a practical science lesson. He explained how they create their meat and their burgers. We say create because it didn’t feel like they simply make burgers, there’s more to it than that. It all starts with their own butcher. The guys wanted complete confidence as to what’s in their product, so they went ahead and got their own butchery. This lets them ensure that their meat is exactly as they want it. They use two cuts of native breed, outdoor, grass-fed beef – chuck and rib cap. Now chuck steak is a burger staple but the really interesting thing here is the rib cap, a fatty cut taken from the rib-eye. They combine this in an 80/20 ratio, giving them exactly the fat content they want in their burgers. There are two reasons for this, first it allows them to bind their patties without any extra ingredients and second it produces a far greater flavour once cooked. Now in the old days the guys had trouble sourcing this type of mix, butchers thought they were mad, no way, not doing it. Well, that’s all changed now. Plus, they’ve got their own butcher, so heck ‘em. We were then let in on a piece of info, not so much a secret, more of a process that is integral to Honest Burgers’ burgers. The way the patty is formed. So pretty much every burger place takes their beef and minces it, often several times. That means pushing it through small holes at great pressure, eviscerating the meat and leaving what is essentially strings of meat paste. Here’s the thing, Honest doesn’t do that! Instead, they chop their beef, albeit a lot, to form the right consistency for a burger. This has a bunch of amazing benefits like holding in flavour and keeping the meat really tender, as we were about to find out. One final thing to add is that due to the chopping method under highly controlled conditions in their specially licensed butchery, Honest Burgers are able to serve their burgers pink and this is how they recommend you have it. Tom wanted us to try the burger naked, as in no toppings, no bun, obviously. The chefs got to work, cooking fresh, unseasoned burgers on a super-hot flat top grill. This is the first time the burgers see anything that’s not beef as they are perfectly seasoned on the grill as they cook. This is to stop the seasoning pulling any precious moisture out of the burger pre-cook. The result is astounding. Given only a fork, we were easily able to cut through the beautifully pink burger, the outside nice and crunchy, the inside perfectly tender. Just the smell alone was fantastic and the taste was pure, high-quality beef with no distractions. We’d recommend trying this, just order an extra patty on the side so you really know what’s going on here. That wasn’t even our entire night. With great meat comes great potato-bility. We gladly gave our attention to Phil who was going to give us a crash-course on the potato side of the business. It sounds fairly simple, making chips and for 99% of chips it is. You open the bag, put them in the fryer, take them out, great. But 99% of the time you’re going to get a starchy, bland run-of-the-mill affair. Not with Honest Burgers. Tom and Phil wanted their burger to be a pairing, awesome burger, awesome chips. Coming from a restaurant background, they knew a bit about chips, you triple cook them for that lovely crunchy exterior and fluffy inside and that works. Honest Burgers complimentary chips were a hit from day one, but as time went by they were finding the fries to be a little unpredictable. They would be flying high in April, shot down in May kind of unpredictable. This prompted the guys to seek outside expertise in the form of a potato scientist. Almost overnight their eyes were opened to the complexities of the potato, the type, the time of year, the storage and most importantly, the sugar content. It’s the sugar in a potato that’s causing your fries to turn a nasty dark brown colour, you can cook them all you like, they’ll just soak up oil and get soggy. With all of these new answers in their pocket, Tom and Phil set out to ensure their potatoes were perfectly sourced, maintained and cooked to bring down that sugar content and keep those fries crispy and fluffy. Top these off with Honest’s signature rosemary salt and you’ve got chips that don’t quit. 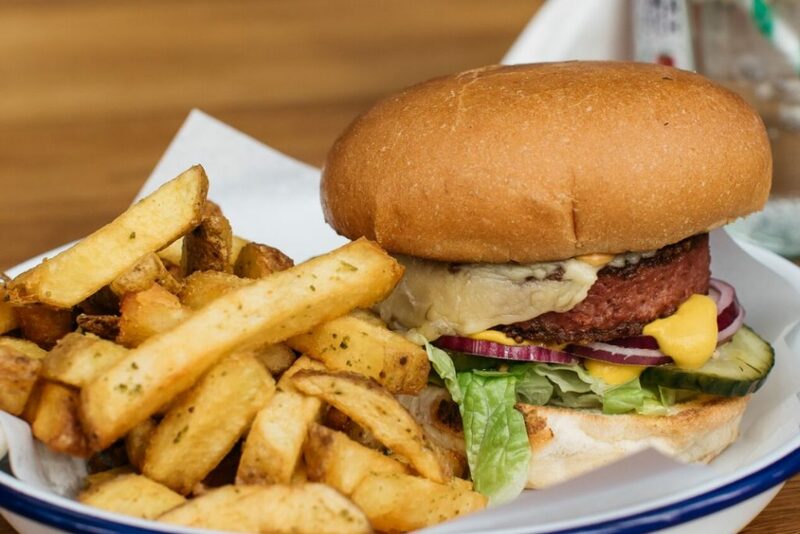 To summarise, the chips you get with your Honest burger are of the highest standard, super tasty and always fresh. Now after all this learning we had worked up an appetite. It didn’t help that dozens of tasty creations had been flying out of the kitchen all night, right before our very eyes. The friendly and very capable servers took over and we ordered burgers from the menu with new found passion. Another cool thing about Honest Burgers is that each branch has a special burger with added ingredients made of local produce. Brighton’s current special has battered cod’s cheek and Mayfield Smoked cheese – in case you’re interested! Our table went for a few “Tribute” burgers, a shout out to the USA with bacon and American Cheese. We also grabbed some onion rings, chipotle slaw and beef and bacon gravy, just ‘cuz. We won’t repeat ourselves by giving you a full review of the food, check out our review in April’s edition of BN1 Magazine, but I will say this, it was a tasty burger! The sides were awesome too, massive, crunchy onion rings, spicy slaw, deep, rich gravy and obviously those rosemary salted chips that keep you coming back. We washed this all down with Honest Burgers own brand beer produced by local Brighton micro-brewery, Holler. 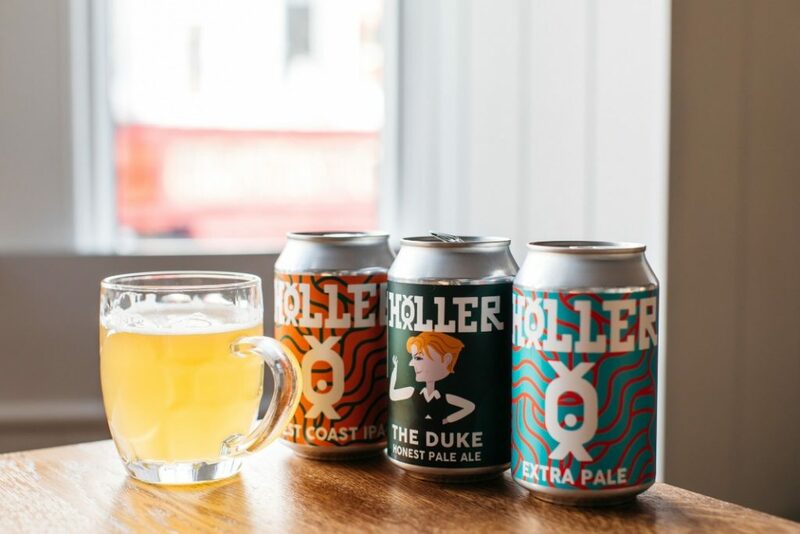 That’s a good beer, probably this writer’s favourite of the Holler beers so far. By the end of the evening we were all burgered out, in a good way though. Knowing about the produce, how it’s crafted, the thought and effort that go into it, really made this a burger experience to remember. Tom and Phil were not only very knowledgeable, but exceptionally hospitable in leading us through their burger experience. We thank them and their staff for the evening, they’ve really put the honest in Honest Burgers with their time, effort and refusal to cut corners. Check out the website here for more info and the menu.